HSC admission 2016 will start from 26 May. 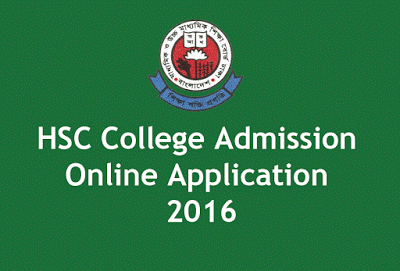 Likewise previous year, this year’s HSC admission process will be done through online system. Admission is open till 9 June, 2016. Those who applied for rescrutiny will have to apply for HSC admission during this time. A student can apply for as much as 10 colleges through online and 10 more through SMS. Online application will cost 150tk for all 10 colleges. Applying via SMS will cost 120tk for a college and students will be able apply for only 1 college or 1 shift at a time via SMS. To apply online, students will have to pay admission fee first. Admission fee is payable only via Teletalk Mobile. CAD<space>WEB<space>First 3 Letter of Board<space>Roll<space>Year<space>Registration No. Here “DHA” is the first 3 letter of board, “123456” is roll number, “2016” is year and “1234567890” registration number. If the admission fee is correctly deposited, a confirmation SMS with a Transaction ID will be sent to mobile. Here “12345678” is PIN and “018XXXXXXXX” mobile number. The result and all info about admission will be sent to the mobile number one adds in the SMS. Note: A mobile number registered through Biometric System is required. After paying admission fee, visit www.xiclassadmission.gov.bd and click apply online. Then enter your Roll number, Board, Year, Reg. No. If you enter above items correctly, you will be able to see your name, father’s name, mother’s name and grade. If you don’t see your name and other info after entering Roll, Reg. No. correctly, you have to enter money receipt (Transaction ID). After 30 minutes of completing this process, you will be able to apply online. Then enter mobile number. This mobile number will be used to send any information about admission. So you have to enter it twice to make sure you are entering it right. Then Select your group, shift and version. You can select 10 colleges here. Choosing college is very important. Before choosing college you must know about the college and the grade it asks for. You can ask your parents or guardian to make a list of colleges you want to apply. After entering all the necessary data, click “Submit”. After submission a form will appear with the details of the application. If you want, you can download and print the form. NOTE: Students won’t have to apply online for all 10 colleges at a time. If you want, you can apply 3/4 colleges first and remaining 7/6 whenever they want during admission date. Type SC for Science group, HU for Humanities, BS for Business Studies, HS for Home Science, IS for Islamic Studies and MC for Music. Type SC for Science, GE for General and MU for Muzabbid. *Shift: Type M for Morning shift, D for Day Shift, E for Evening Shift. And if there’s no shift in the college you are applying, type N.
*Version: Type B for Bangla version and type E for English version.